Ex-Lieutenant Colonel Hyde resents his enforced retirement from the army after 25 years unblemished service. Methodically he plans to even the score with the Establishment. The plan is Operation Golden Fleece. Army records provide him with the names of the seven skilled men the scheme requires. In due course, with appropriate military precision, the Colonel's plan to relieve 'a certain City bank' of a million pounds swings into action. Jack Hawkins stars in this tense and convincing film. 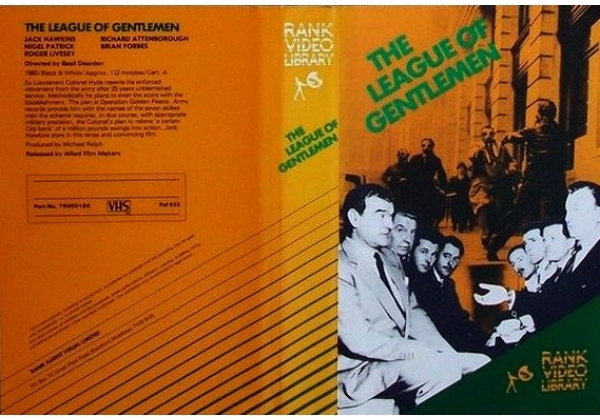 Or find "League of Gentlemen, The" on VHS and DVD / BluRay at Amazon.